The classic Coledale Horseshoe took place in wet but mild weather conditions on Saturday 7th April. Seven Todmorden Harriers took part in this tough 8.5 mile Lakes fell race which includes 3,300 feet of climb. A daunting climb out from Braithwaite, near Keswick takes runners up Grisedale Pike then on to Eel Crags and Barrow, culminating in a very fast descent to the finish. 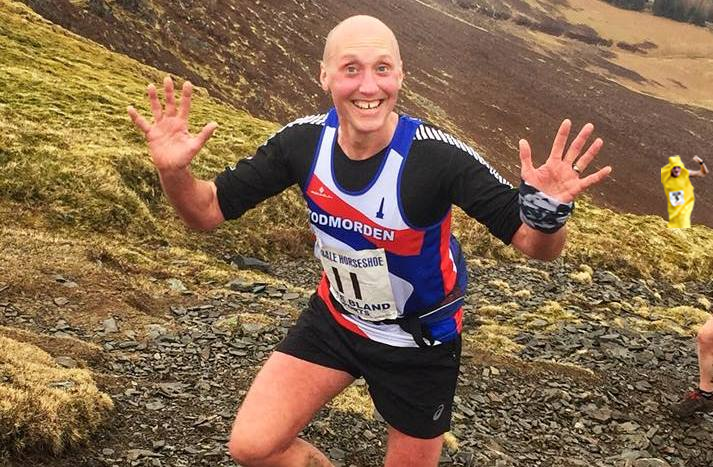 Annie Roberts continuing in fine form, was first back in for Todmorden in 1:33 and fifth women overall, followed by Darren Graham (pictured) 1:38, James Riley 1:43, Keith Alger in 1:48, Lucy Hobbs in 2:04, Claire Alger in 2:17 and Sue Roberts 2:22. Carl Bell from Keswick won the race in 1.11, Emma Clayton from Leeds City was first woman in 1:25. Due to injury this was Lucy’s first race in six months and a tough return it was. While she claimed to enjoy it, she was also left feeling she needs to do much more of it!